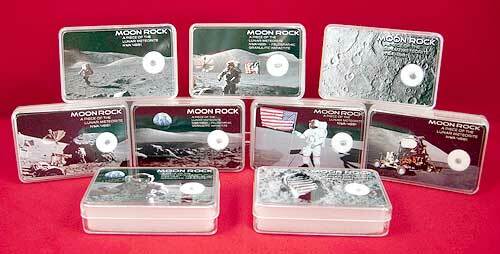 Moon Rocks For Sale | Lunar Meteorites For Sale - The Meteorite Exchange, Inc. These quality Lunar meteorite display boxes make nice additions to your meteorite collections as well as wonderful and unique gift items. Each display box contains a genuine specimen of Moon meteorite from Northwest Africa. The Moon meteorite used in each display box has been classified as a Lunar meteorite and is listed in the Meteoritical Bulletin Database. Moon meteorites are extremely rare and when the available inventory has been exhausted it becomes necessary to use a different classified Moon meteorite to fill our Moon Boxes. The Moon Box meteorite you receive will list which NWA Numbered Moon meteorite is contained in the box. Please see the Reference section below to see the list of Lunar meteorites used in our Moon Boxes. Earn Cash Rewards on each purchase. Each display box contains a genuine specimen of lunar meteorite that has been classified and is listed in the Meteoritical Bulletin Database.